What Was in Colonial Cups Besides Tea? Cider, water, milk, and whiskey! Practically everyone in 18th America drank chocolate and tea, but what about cider, water, milk, and whiskey? Well, of course they drank water and milk. The colonies were an idyllic paradise—lush forests, rolling hills, crystal clear streams. Not so much. In fact, water and milk were big carriers of disease. Americans stuck with cider and whiskey because they were alcoholic. Alcohol-based drinks typically wouldn’t spread disease, and they had a much longer “shelf-life,” than non-alcoholic beverages. Even children drank alcohol—of course it was significantly watered down. 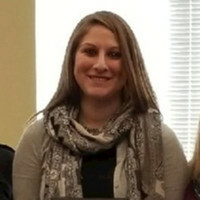 Cider: Apple trees were not native to North America. 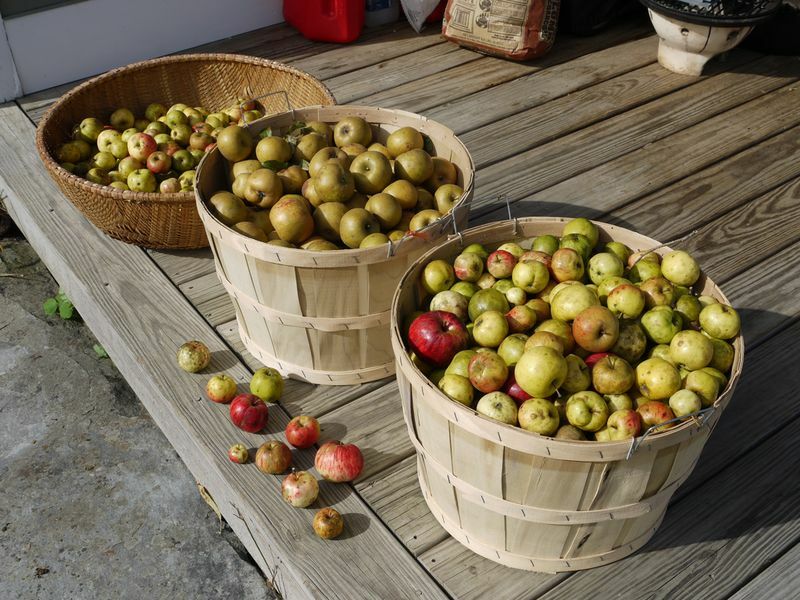 The colonists had to bring apple trees with them aboard ship to the New World. And because apple trees are not native, neither were the insects to pollinate them. Honeybees were also imported. So the story of Johnny Appleseed spreading apple tress wherever he went is true… Well, ok he was actually a missionary named Jonathan Chapman, who planted apple nurseries across the mid-west, but the concept is still the same. Other pioneers took apple trees across the nation; later some even went by wagon along the Oregon Trail. By the late colonial period there were so many apple trees that everyone, even children, drank cider. That’s hard cider—it lasts longer. A typical middling family of six drank about 90 gallons of cider each year—that’s 15 gallons per person. Water: You probably learned that the colonists lived simple, pastoral lives. And what would they drink besides water? This is only half true. Colonists on rural farms or on the frontier could find natural, clean sources of water, or could dig wells to reach fresh water. 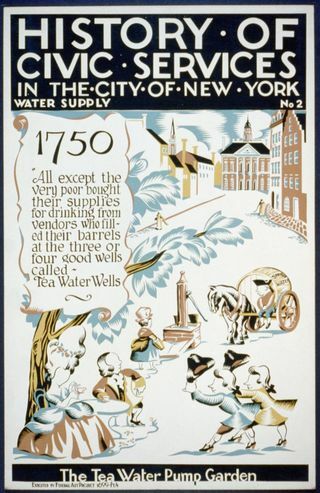 Colonists in the city drank “bottled water,” from the countryside. City dwellers used bodies of water for garbage disposal, not drinking. Just slaughtered a pig? Throw the carcass into the river. Need to empty your chamber pot? Dump it down the well. In defense of the colonists, they did not know about germs or bacteria. They could however, clearly recognize clean water from dirty water. But clean water was only available outside the city. This would have been a problem, if the tea-water trade hadn’t blossomed. 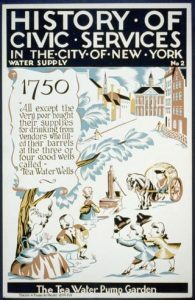 Poster for Federal Art Project series on the history of civic services, showing citizens socializing around water pump in New York in 1750. Federal Art Project 1699, Pt. 4, . “Tea-water” was clean water usually found on the outskirts of a city. It was primarily used for making tea; though it was safe to drink alone. Workers, known as tea-water men, drew the water, sealed it in kegs, and transported it into the city. Having this “bottled water” delivered cost about 45 shillings per year. Today that’s about $310. But in the late colonial era, it took the average tradesman one month to earn that much money. A diseased cow, unable to stand, is pulled up to be milked. Distilleries kept a stable of such animals, fed them mash and whiskey slops. The milk made the beasts tipsy and often sick.” Image from: Dupuis, E. Melanie. Nature’s Perfect Food. (New York University Press: New York, 2002). Milk: On the farm it was safe to drink milk, but few people did. Milk by-products like cheese, butter, or yogurt were more common because milk spoiled so quickly. This was especially the case in cities. Unlike water, which could be transported, by the time milk from the countryside reached the city it was likely to have gone bad. 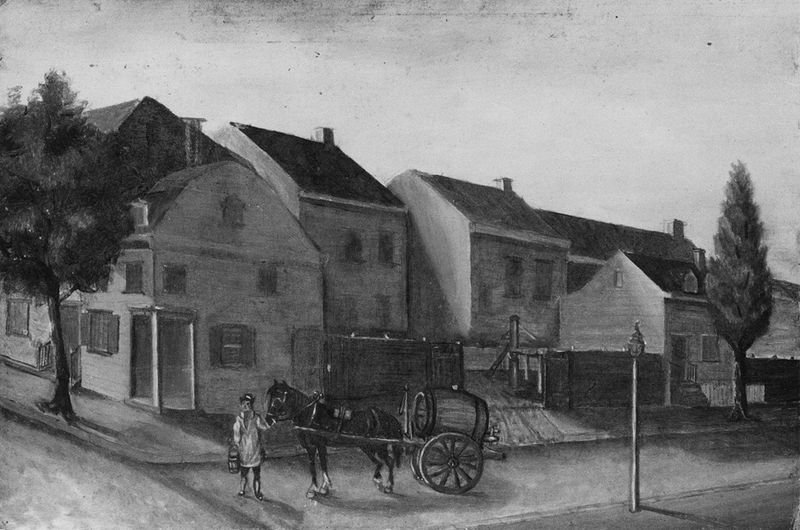 Since transportation was the main issue, industrious brewers attached cow stables to their city breweries. “Swill” milk stables, provided cities with milk. The problem: the cows’ diet consisted of the leftover grain from beer production, or “swill.” This does not make for a happy cow. In fact, most of these cows were sickly and diseased. 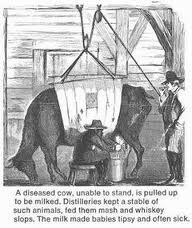 At best they produced very poor quality milk; at worst they spread diseases, such as cholera. The average person consumed less than one third of a pint of milk a day and most of this was through cooking or in coffee, tea, or chocolate. 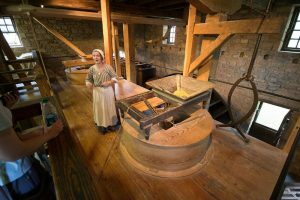 George Washington’s Distillery and Gristmill at George Washington’s Mount Vernon Estate, Museum, and Gardens. Photograph by flickr user “eclectic echoes” (Eric Heupel), used under the creative commons license. Whiskey: Rum was shipped directly from the West Indies to northeastern port cities. Before the American Revolution, rum, not whiskey was the colonial favorite. A boycott of British goods before and during the Revolution prompted colonists to invest in distilling a uniquely “American” drink. Kentucky Bourbon soon became popular. The soil in Kentucky was perfect for growing corn, from which American whiskey, or Bourbon, was made. (Bourbon was made up of at least 51% from corn, while whiskey was anything less than 51% corn based.) The only problem was that it was very difficult to transport goods (including Bourbon) across the Appalachian Mountains, to east coast cities. To reach the east coast, Bourbon had to travel by land to a port on the Mississippi River where it was loaded onto boats headed for the port of New Orleans. From New Orleans the Bourbon was loaded on to larger ships that traveled around Florida and then up the coast. 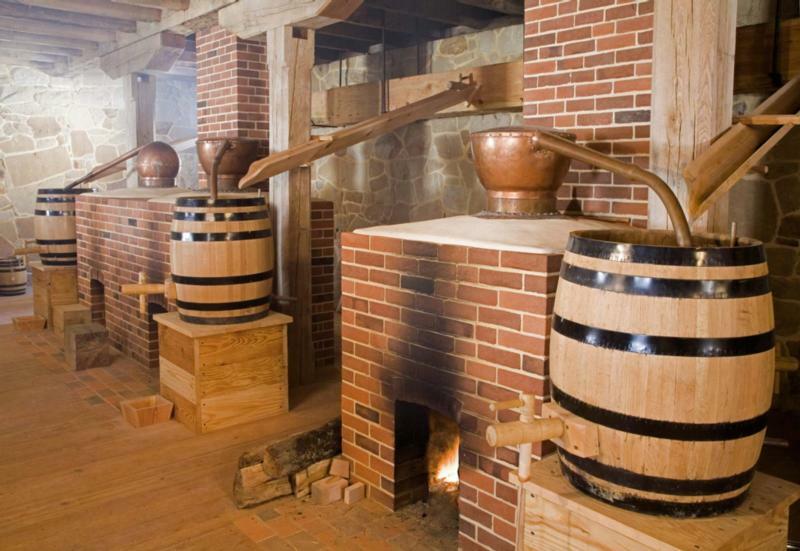 Within a few years, colonists east of the Appalachians, began whiskey production using barley and rye. These crops grew better than corn on the east coast. Within only few years, whiskey surpassed rum consumption. The story behind each colonial beverage is packed with details about colonial life. Before this project, I couldn’t imagine that something so small as what someone drank 250 years ago could have such meaningful and revealing ties to history, at large. It just goes to show that even the things we take for granted have fascinating stories to tell. Originally published by Smithsonian Institution, reprinted with permission for educational, non-commercial purposes. This entry was posted in Food, History, United States. Bookmark the permalink.